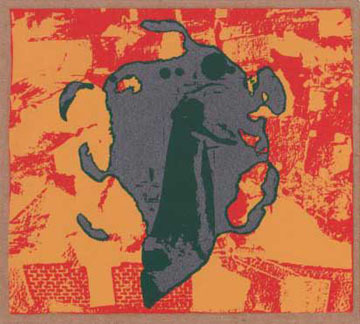 CD reissue of Siwa #6 in screenprinted gatefold sleeve. First released on LP in 2000 in an edition of 300 which sold out pretty much overnight. Three tracks recorded at Kid Ailack Art Hall in Tokyo in the late 90's. Just over 40 minutes of solo improvisations for er-hu, voice, kengali, rings, cymbals. The recording has been remastered for the digital format but contains the same material as the original LP. "Chie Mukai is best known in the West, if at all, as the leader of Japan's most otherworldly dream psych-pop unit Ché-SHIZU. In that group, her gorgeous work on er-hu (a traditional two-stringed bowed Chinese instrument), sliding up and down through the cracks in conventional tonality, melds perfectly with the trembling naiveté of her vocals. It's a unique sound, immensely personal, and immediately identifiable. However, Mukai also has a lengthy complementary, though much less well-known, career as a solo performer and improviser dating back to her time in the East Bionic Symphonia in the late 70's (trainspotters might also want to note her peripheral involvement with the LAFMS scene). On any given week in Tokyo, you're likely to find her collaborating in a basement somewhere with like-minded multimedia creators, butoh dancers, musicians, performance and visual artists, installationists... Each December she organizes Perspective Emotion, a full-on festival of multi and mixed media performance. In recent years, Ché-SHIZU has fallen into inactivity and Mukai's adventures in the improvised mode have come to take on a far greater importance to her. These previously shadowy activities have finally attained some proper sunlit documentation - most notably, the love-hate dynamics of her showdown with Masayoshi Urabe (Dual Anarchism, on Siwa); her collaborations with Ramones Young, the obviously alcohol-inspired attempt to meld Ramones covers with a Lamonte Young methodology; and the Enkidu unit with Eric Cordier and Sei'ichi Yamamoto. But while all of these are just fine and dandy, for the full unadulterated Mukai experience, you really have to hear her playing solo, expanding soul and sense and touch to fill space. Which is why it is such an unadulterated pleasure to have this SIWA album, her first release outside of Japan, back in print. Three longish pieces, all recorded live in the late nineties. There's a far fuller drone sound to her er-hu here, compared to that on her previous solo release (Kokyu Improvisation, on PSF), a wavering intensity that pulls your brain straight into a sensation-dulled trance. And with none of the evil wince often associated with solo violin improvs, you're free to fully appreciate the fractional control and deep humming resonance of the instrument. It's a beguiling sound, seeming to combine both earth and air in one eternal thrumming, shimmering pull of gut on steel string. Mukai augments the sound with an occasional percussion crash, and a verse or two of wordless higher-mind vocalization. What more could a human ask for? This is sumptuous late-night improv, a fine goose-feather pillow for addled minds everywhere."